By Erica Poletto, M.D., Mary G. Mallon, M.D., Randy M. Stevens, M.D., Catherine M. Avitabile, M.D. Anatomic variants of the aortic arch and its branches are relatively common, with an estimated prevalence of 0.5% to 3%.1 The majority of these variations are of no clinical significance and are detected incidentally. However, several of these anatomic variants, grouped together under the term vascular ring, can produce respiratory symptoms or dysphagia due to encirclement and extrinsic compression of the trachea or esophagus, respectively. The contributors to the ring can include the aortic arch, arch vessels, or the ligamentum arteriosum, which is the fibrous remnant of the ductus. 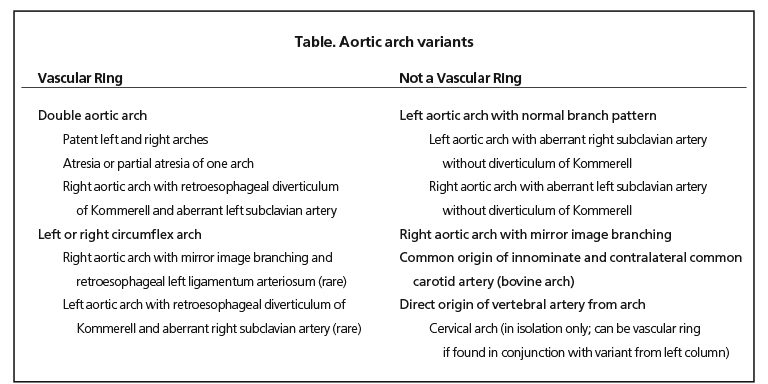 The Table presents a list of aortic variants that may be considered vascular rings. 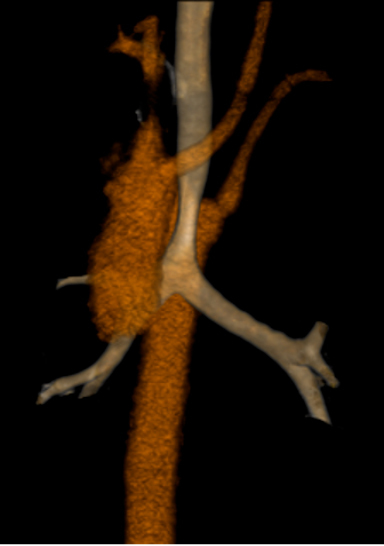 Anatomic variation of the pulmonary artery and its branches is rarer than that of the aorta. Pulmonary arteries may be hypoplastic or absent, in isolation or associated with congenital heart disease. A pulmonary sling is a specific variant in which the left pulmonary artery arises from the right pulmonary artery instead of the main pulmonary artery. This abnormality can present with respiratory symptoms, similar to a vascular ring. This review will discuss many common and rarer anatomic variants of the aortic arch and pulmonary arteries, with an emphasis on imaging modalities for vascular evaluation and their role in clinical decision-making and surgical repair. Any discussion of vascular rings and pulmonary artery slings must begin with a review of the embryology of the aortic arches, as this will help the radiologist or clinician understand potential anatomic abnormalities. The aortic arch system develops from the appearance and persistence or disappearance of six paired vessels originating from the embryonic foregut that connect the truncal aortic sac (the most distal part of the embryonic heart tube giving rise to the ascending aorta and the branch pulmonary arteries) to the paired dorsal aortae, which later fuse to form the descending aorta (Figure 1). When certain arches fail to regress, they can persist into the post-natal period, giving rise to a multitude of variants. 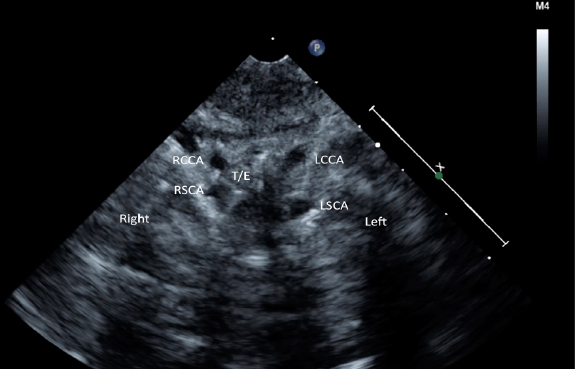 When the left and right 4th arches persist to connect the truncoaortic sac to the dorsal aorta, the result is a double aortic arch. Both arches can persist in their entirety, or a portion of one of the arches (typically the left arch) can become atretic. When the left 4th arch regresses in its entirety, a right aortic arch results. With a right aortic arch, the left subclavian artery may arise from a left innominate artery (called mirror-image branching, because it is the vertical mirror-image of standard anatomy). Alternatively, the left subclavian artery may arise as a separate branch from the distal aspect of the right-sided aortic arch; this aberrant subclavian artery must cross the midline posterior to the esophagus to achieve its leftward course. When the dorsal aorta contralateral to the aortic arch persists, and the ipsilateral dorsal aorta regresses, the result is a circumflex aorta. Right circumflex aortic arch with left descending aorta is more common than left circumflex aortic arch with right descending aorta. The subclavian artery contralateral to the side of the aortic arch may arise from the innominate artery or aberrantly. If the aortic arch arises from the left or right 3rd arch, instead of the 4th arch, a high-lying aortic arch results. While this is called a cervical arch, the arch is typically at or just above the clavicular heads. While the embryology of pulmonary artery sling is unclear, it is likely due to a failure of the proximal left 6th arch (precursor of the proximal pulmonary arteries) to join the distal lung buds. 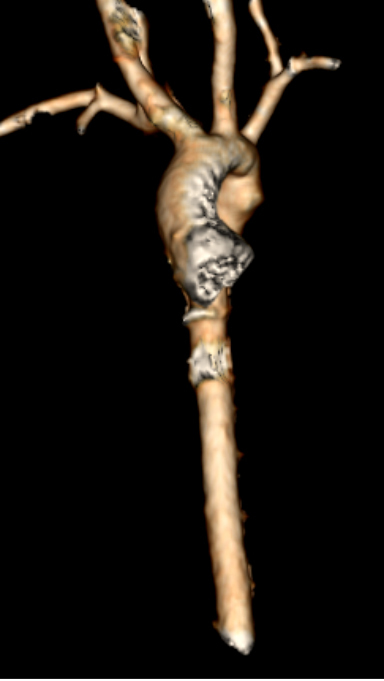 A secondary vessel originates from the right side to join the distal lung buds. Clinical presentation of patients with vascular rings is variable and is related to the degree of tracheal compression. Infants often present with stridor, with significant increase in respiratory distress in the setting of a superimposed viral illness. The presence of stridor only in the expiratory phase of respiration, indicating an intrathoracic cause of stridor, will bring a vascular ring toward the top of the differential diagnosis. In relatively “looser” rings, lack of respiratory symptoms may delay diagnosis until the child begins eating solid foods. Toddlers and older children may exhibit difficulty eating solid foods and swallowing (dysphagia lusoria). Older children and young adults may have a lifetime history of asthma or recurrent bronchitis prior to making the diagnosis. While surgical relief of the ring may result in clinical improvement, some symptoms may persist due to tracheomalacia. Although patients may be incidentally diagnosed when imaged for another indication, careful review of the patient’s history often reveals subtle respiratory symptoms or dysphagia. Because patients with vascular rings and slings often present with respiratory symptoms, the imaging evaluation often starts with a two-view chest radiograph. 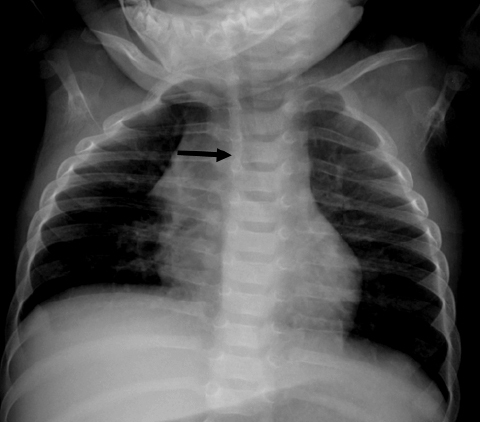 In up to 95% of patients with a vascular ring/sling, an abnormality is visible on chest radiographs.4 However, many factors may limit accurate assessment of the trachea on the frontal view, particularly in infants: An atretic or hypoplastic arch may not be large enough to cause mass effect; the large thymus may obscure the aortic arches; and radiographs may be obtained during expiration and/or with rotation that limits evaluation of the position of the trachea. Patients with vascular rings can also present with dysphagia, prompting a fluoroscopic upper gastrointestinal (UGI) study. This study can contribute important information to the characterization of a vascular ring/sling. 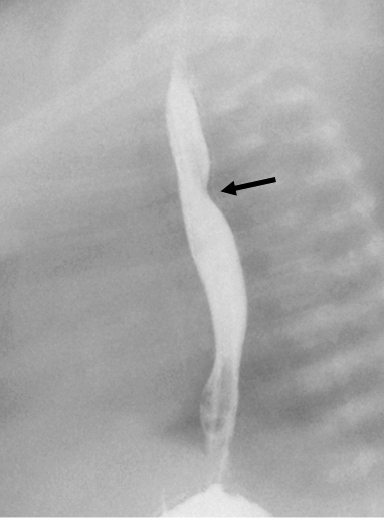 Indentation on the posterior esophagus on a lateral view suggests a vascular ring, but does not distinguish the type. While imaging in the frontal projection can identify the sided-ness of the aortic arch(es), the indentation on the esophagus from the aortic arch(es) can be subtle. 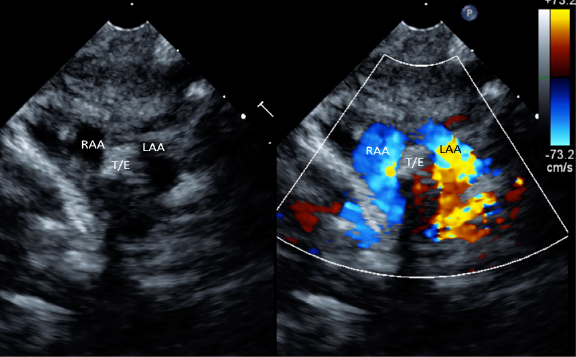 Additional imaging is often required to completely characterize the nature of the aortic arch. 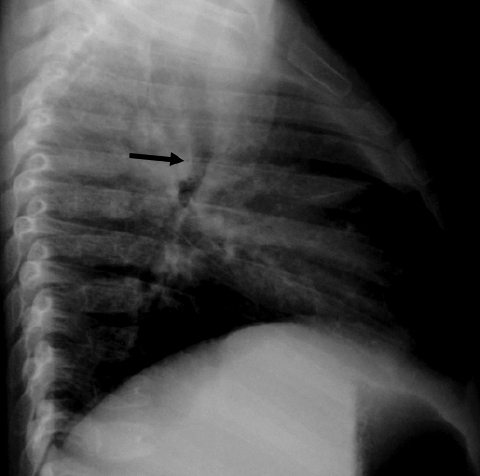 Indentation on the anterior esophagus on a lateral view suggests the presence of pulmonary sling. Once suspicion of vascular ring/sling is raised, evaluation typically progresses to cross-sectional imaging. Echocardiography is a noninvasive imaging modality that imposes no risks of radiation exposure or contrast administration. Echocardiography provides information about cardiac function and direct visualization of cardiac and vascular anatomy. The sensitivity of echocardiography for evaluating vascular rings/slings varies widely (30% to 100%), depending on the sonographic window available and sonographer skill.4 Echocardiography has the potential to determine arch sidedness and delineate the branch pattern (Figure 2), but is limited regarding tracheal or esophageal compression by the surrounding vasculature. Historically, UGI followed by echo- cardiography and traditional angiography comprehensively evaluated for vascular ring/sling. Catheter angiography with rotational angiography and 3-dimensional reconstruction can provide exquisite anatomic detail of the aorta and the great vessels (Figure 3);5 however, invasiveness of the study and presence of ionizing radiation limit the desire for its application. 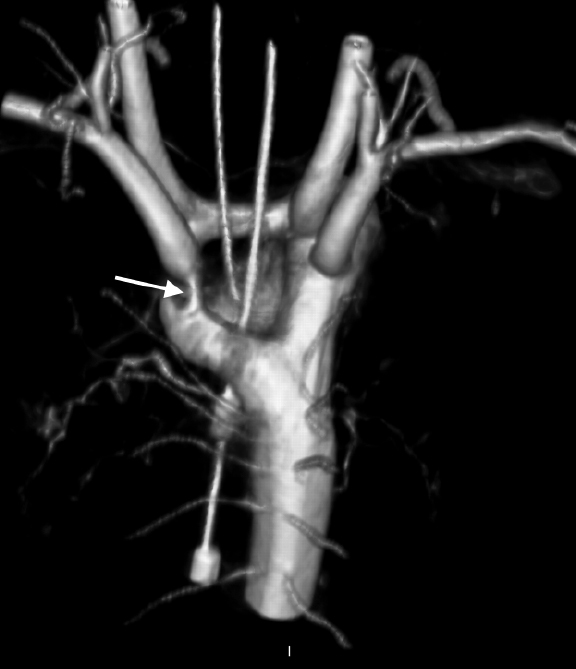 This combination of imaging studies as the standard workup has pre-dated the advent of high-quality cross-sectional angiography using either computed tomography (CT) or MRI, which tout up to 100% sensitivity for vascular ring evaluation.6 The ability to noninvasively visualize in detail the entire vascular ring or sling and the associated extravascular and extra-cardiac findings is a major benefit of using CT and/or MRI cross-sectional angiography over the aforementioned historic evaluation scheme. When determining which modality to use, one must consider availability, risks and benefits. While CT angiography (CTA) carries risks associated with iodinated contrast administration and exposure to ionizing radiation, the modality may be more available than MRI, and requires little time for image acquisition. CT imaging enables accurate contrast bolus timing and decreases the need to sedate patients, which carries its own risks and would have a greater impact on a pediatric population as compared to adults. In a patient who cannot remain immobile for MRI and is not a suitable candidate for sedation or anesthesia, the rapid scan time of CT would be most beneficial. Cross-sectional images can be used to produce 3-dimensional models of the great vessels using 3D printing. While still in its infancy, this technology may be increasingly used as a roadmap for surgeons performing corrective surgery. Vascular rings are anomalies in which the trachea and esophagus are completely encircled by vascular tissue, although some portion of the vascular ring may be atretic. When a portion of the ring is atretic (eg, a portion of a double aortic arch), the diagnosis of a vascular ring must be inferred from other imaging “clues,” as vascular imaging modalities depend on the flow of blood through an open lumen. The presence of one of the “3Ds” indicates a vascular ring in all cases when it occurs opposite the side of the aortic arch: Diverticulum, Dimple, or Descending aorta contralateral to the aortic arch (circumflex arch).13 A diverticulum is a dilated outpouching off the descending aorta that gives rise to the aberrant contralateral subclavian artery. A dimple is a small blind pouch off the descending aorta. – with right descending aorta (left circumflex aortic arch). Chest radiography may show variable extrinsic mass effect on the right and (rarely) the left inferior trachea on the frontal view. A more reliable finding is anterior bowing of the inferior trachea on the lateral view (Figure 4). There will be extrinsic mass effect on the right and left aspects of the esophagus on frontal views during UGI, and extrinsic mass effect on the posterior esophagus on lateral views (Figure 5). 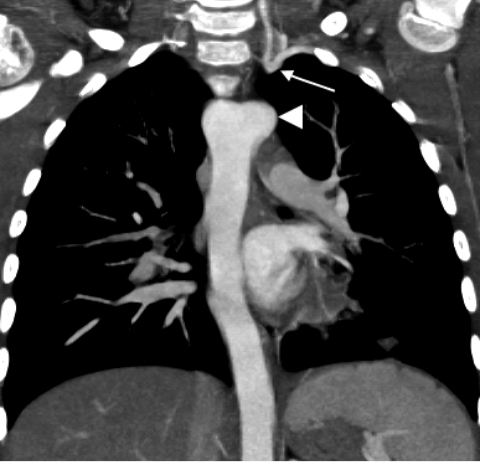 CT and MRI will show the dual aortic arches and their branch patterns (Figure 6). Classically, an axial image through the level of the branch arteries will show symmetry of the common carotid and subclavian arteries. As the vessels encircle the trachea, it will become narrowed. Volume-rendered images of the airway provide exquisite visualization of luminal narrowing. The proximal thoracic esophagus may be dilated cephalad to the vascular ring. In cases where the arches are codominant, an advantage of MR is that phase contrast sequences can quantitate which arch has more flow. Rarely the left aortic arch is atretic at the origin of the left subclavian artery. In such cases, the subclavian arterial flow is reconstituted via retrograde flow down the vertebral artery (Figure 8). 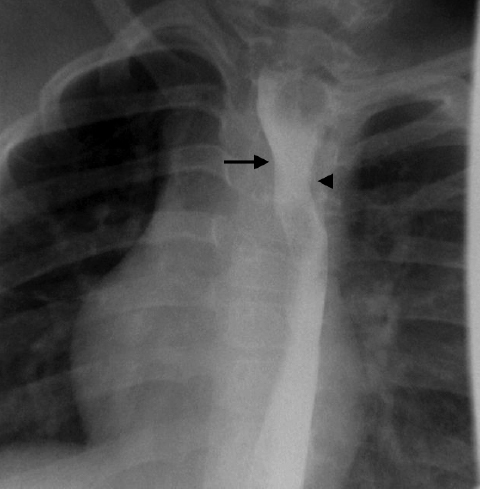 Chest radiography may show extrinsic mass effect on both the right inferior trachea on the frontal view and anterior bowing of the inferior trachea on the lateral view. 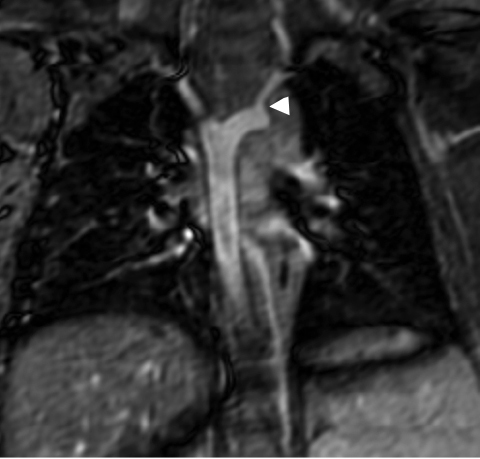 The appearance is typically indistinguishable from that of a double aortic arch. On UGI, the right arch will have extrinsic mass effect on the right aspect of the esophagus on frontal views, and the diverticulum of Kommerell will cause extrinsic mass effect on the posterior esophagus on lateral views. The posterior impression from the diverticulum will typically be smaller than that of double aortic arch or circumflex arch (Figure 9). 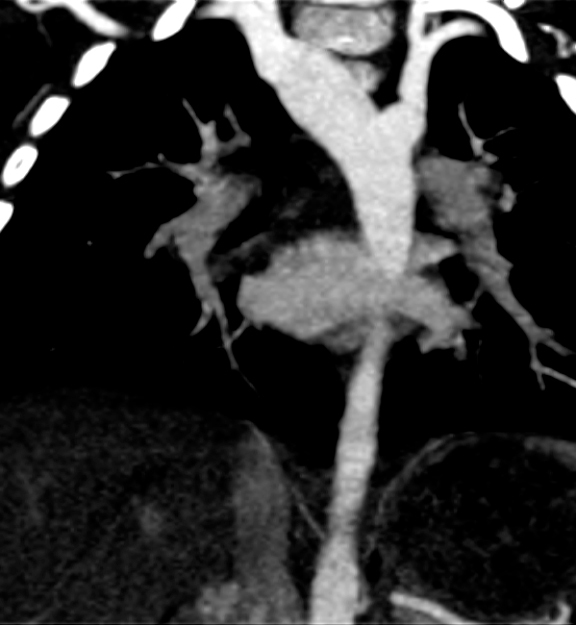 CT and MRI best distinguish right arch with aberrant left subclavian artery as a vascular ring from those that are not. 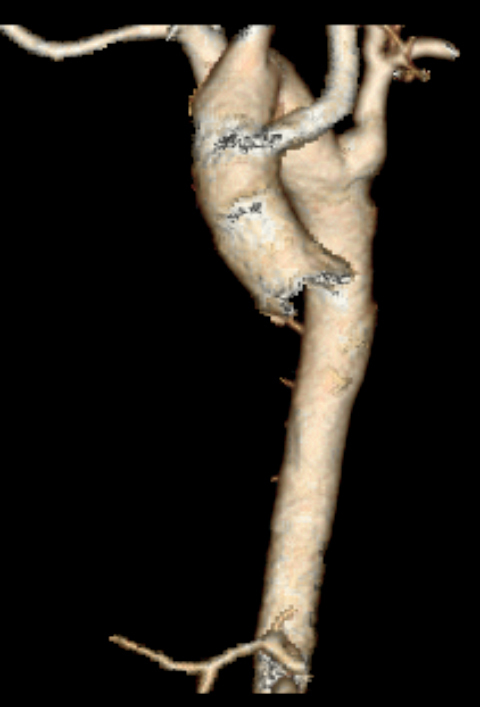 The ligamentum arteriosum is visible if it is partially patent or calcified; this is better seen on CT than MRI. The presence of a left-sided ligamentum arteriosum, diverticulum of Kommerell, and tracheal narrowing are all suggestive of a vascular ring (Figure 10). If the proximal aberrant subclavian artery maintains uniform caliber, and there is no airway narrowing, then a vascular ring is unlikely. When the diagnosis of vascular ring is questionable, the presence/absence of symptoms may guide decisions to perform corrective surgery. 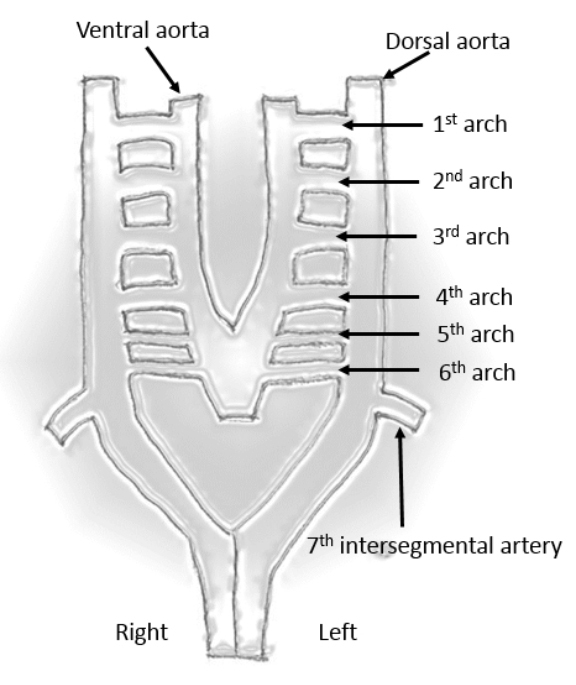 In the third most common type of vascular ring, a right aortic arch crosses midline in the superior thorax, coursing posterior to the trachea and esophagus, then descends to the left of midline. 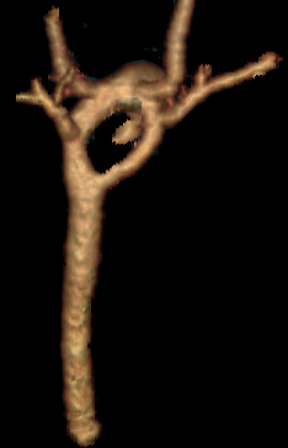 The branching pattern may have a left innominate artery or an aberrant left subclavian artery. In either case, there is a vascular ring when there is a left-sided ligamentum. 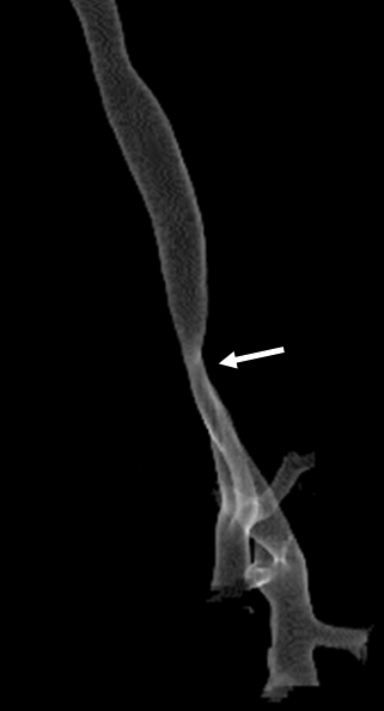 On radiography, the vascular ring is inferred by the presence of a left descending aorta opposite a right-sided arch and anterior bowing of the trachea. 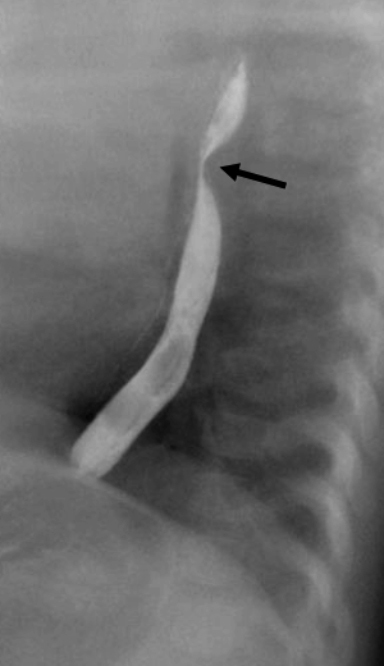 As with other vascular rings, there will be an abnormal impression on the posterior esophagus during esophagram. The size of the impression will be similar to that of a double aortic arch. 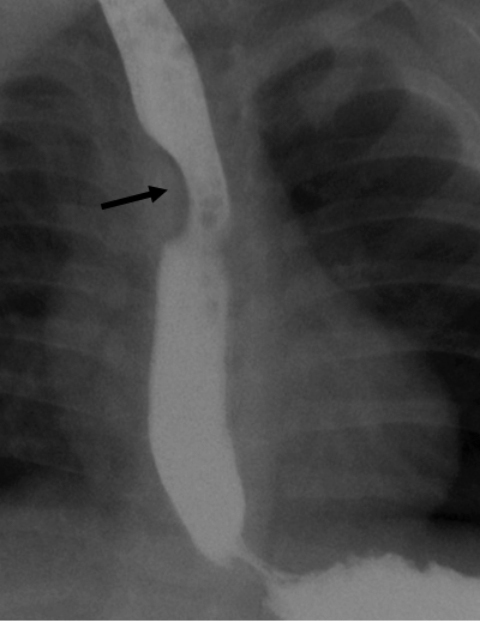 When there is only a single right-sided aortic impression on the esophagus on the frontal view and a large posterior impression on the lateral view, the diagnosis of circumflex aorta is suggested (Figure 11). 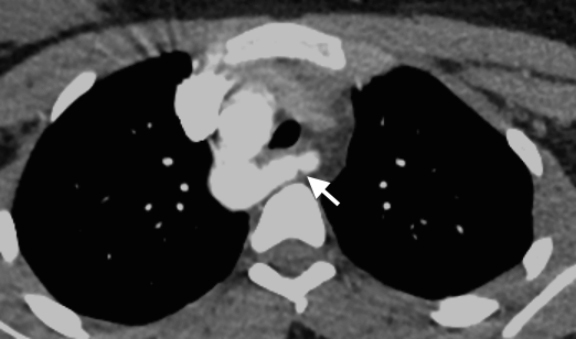 As with other vascular rings, CT and MRI will provide definitive diagnosis of the circumflex arch, delineate the branch pattern, and assess the effect of the vessels on the airway, allowing for surgical planning(Figure 12). 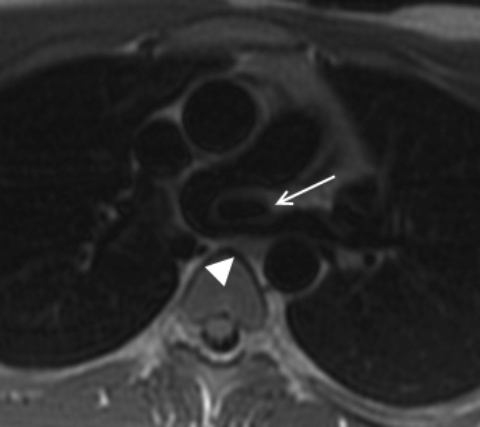 The diagnosis of this rare type of vascular ring may be challenging as its branching pattern is identical to the nonring mirror image right aortic arch. In right aortic arch with mirror image branching, the ductus may be: 1) right-sided from the aortic arch, 2) left-sided off the base of the innominate artery, or 3) left-sided from the right descending aorta (vascular ring). In the last case, the retroesophageal ligamentum completes the ring after the ductus closes. 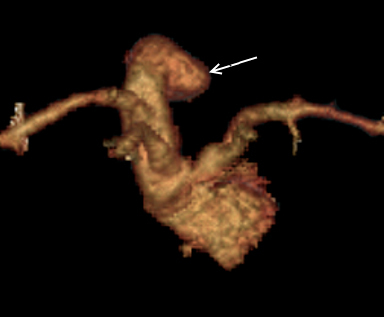 The presence of a subtle “dimple” on the right descending aorta, directed toward the left, indicates the presence of the retroesophageal ligamentum and signifies a vascular ring. Vascular rings in the setting of left aortic arch are very rare. 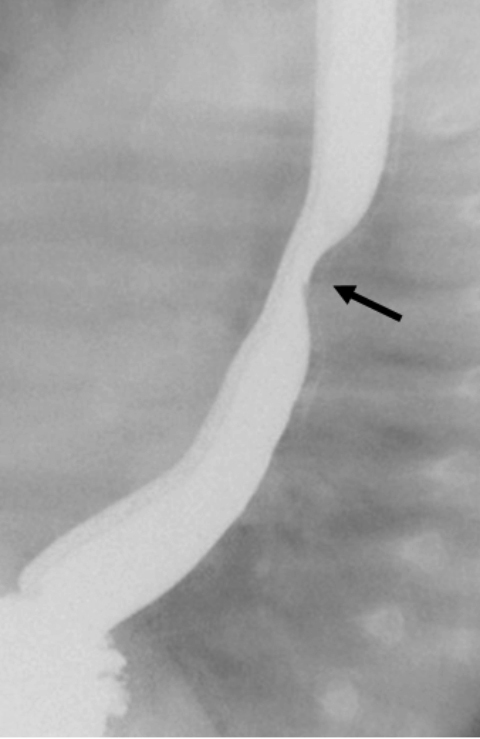 Although much less common than the right aortic arch variant, left aortic arch with retroesophageal diverticulum was the vascular ring first described by Kommerell on barium esophagram in 1936.17 This anomaly is the mirror image of right arch type, with the vascular ring completed by a right-sided ligamentum. Similarly, left aortic arch with right descending aorta (left circumflex aortic arch) is a mirror image of the right-sided lesion with the ring completed if there is a right-sided ligamentum (Figure 13). Diagnosis of pulmonary sling can rarely be made from radiography alone. Asymmetric aeration of the lungs on the frontal view with indentation of the posterior distal trachea on the lateral view suggests a pulmonary sling, with the smaller lung supplied by the pulmonary artery of abnormal origin. The mainstem bronchi may be displaced inferiorly and have a horizontal course, with an inverted T-shaped appearance.14 The anomalous left pulmonary artery may obstruct the right mainstem bronchus. In such cases, the right lung may have retained fetal fluid at birth and then become progressively hyperlucent. As this is the only anomalous vessel to course between the trachea and esophagus, on UGI there will be an abnormal impression on the anterior esophagus, and the trachea will be displaced anteriorly. Fluoroscopy can also be used to dynamically evaluate the airway for tracheomalacia. 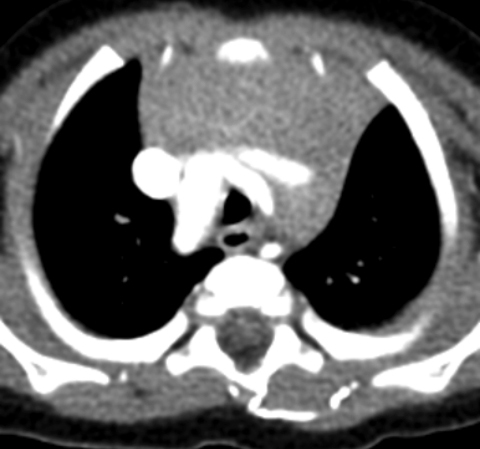 As with vascular rings, CT and MRI will definitively make the diagnosis, and can assess the impact of the pulmonary vessels on the airway (Figure 14). 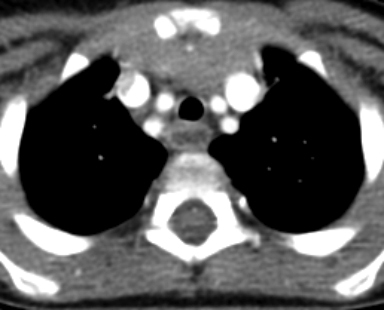 As most of these patients have complete tracheal rings, the trachea may have a round configuration on axial imaging and may be relatively small in caliber. Other airway anomalies can occur, most commonly a bridging bronchus (a bronchus arising from a left- or right-sided bronchus, crossing the midline, supplying a portion of the contralateral lung).19 Such small airway abnormalities are better seen on CT than MRI. An advantage of MRI is that it can quantitate arterial perfusion of each lung; perfusion of the left lung may be decreased. Cine MRI can also be used to dynamically evaluate the trachea throughout the respiratory cycle.6 Pulmonary perfusion can also be assessed with nuclear lung perfusion, utilizing technetium 99m-labeled microaggregated albumin (MAA) (Figure 15). For repair of vascular rings, left lateral/posterolateral thoracotomy is used. The surgeon will run a finger along the esophagus to ensure the ring component is present. In cases where the left component of the vascular ring is an atretic arch or a ligamentum arteriosum, the proximal and distal ends are divided. Usually the tissue is under tension and a gap of 2-3 cm will occur after the tissue is divided, which should suffice in loosening the vascular ring. In cases of double aortic arch, the smaller of the two arches is ligated. After proximal and distal control of the smaller arch are obtained, a test occlusion is performed and the blood pressure is assessed to ensure that no pressure gradient occurs. After dividing, the two ends are oversewn. Again, the area is usually under tension and a gap will occur. The approach for a pulmonary artery sling is anteriorly utilizing a median sternotomy. The left pulmonary artery is reimplanted on the main pulmonary artery, anterior to the trachea. An excessively long or redundant left pulmonary artery may need to be partially resected to prevent kinking.21 Prior compression of the airway causes a longitudinal stenosis, which may require a sliding-plasty of the trachea. The patient may require cardiopulmonary bypass during the resection of the stenotic segment of the trachea, then a sliding of the posterior and anterior segments of the trachea for reconstruction. The reconstructed trachea will then need time to heal; monitoring by a pulmonologist or otolargyngologist is appropriate. Vascular rings and pulmonary sling are a diverse group of congenital thoracic vascular anomalies. Patients present from the prenatal period into adulthood, depending on the extent of airway and esophageal compression. While radiographs and fluoroscopy are excellent screening tools, they poorly distinguish the types of vascular rings. Echocardiography provides excellent anatomic detail, but detailed evaluation is not always possible and airways cannot be evaluated. Cross-sectional imaging (CT and MRI) have become the gold standard in evaluation since they can completely evaluate vascular and airway anatomy, obviating the need for catheter angiography. The risks and benefits of CT and MRI should be considered prior to imaging. Surgical correction has excellent long-term success. Chan FP, Jaffe RB, Condon VR, et al. Congenital great vessel abnormalities. In: Slovis TL, ed. Caffey’s Pediatric Diagnostic Imaging, 11th ed. Philadelphia, PA: Mosby Elsevier; 2008:1591-1604. Edwards JE. Anomalies of the derivatives of the aortic arch system. Med Clin North Am 1948;32:925-949. Weinberg PM. Aortic arch anomalies. In: Allen HD, Driscoll DJ, Shaddy RE, et al, eds. Moss and Adams’ Heart Disease in Infants, Children, and Adolescents, 7th ed. Philadelphia, PA: Lippincott Williams & Wilkins; 2008:730-731. Pickhardt PJ, Siegel MJ, Gutierrez FR. Vascular rings in symptomatic children: frequence of chest radiographic findings. Radiology 1997;203:423-426. Patel B, Coyle JC, Poe E, et al. Three-dimensional rotation angiography imaging of double aortic arch vascular ring. Images Paediatr Cardiol 2013;15(1):1-6. Brown LP. 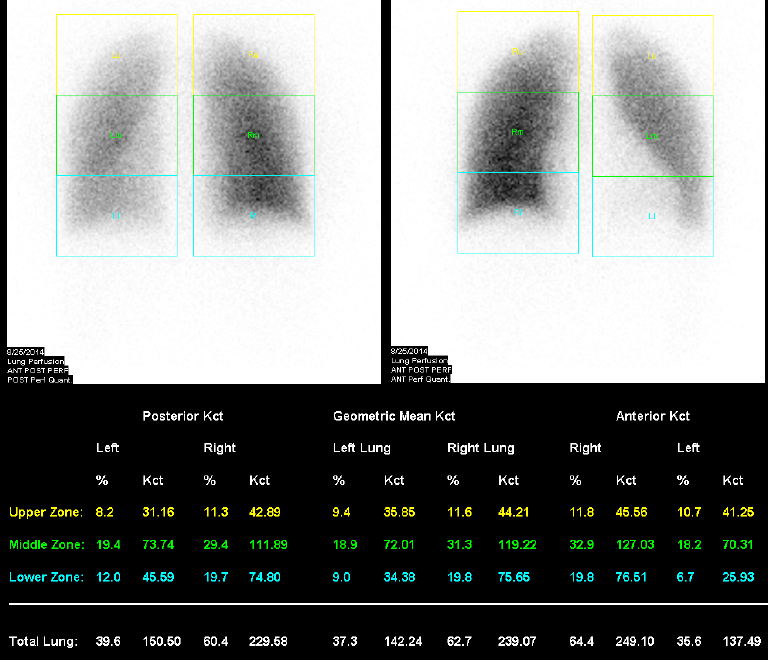 What is the optimal imaging for vascular rings and slings? Pediatr Radiol 2009;39:S191-S195. Etesami M. Computed tomography in the evaluation of vascular rings and slings. Insights Imaging 2014;5:507-521. Kanda T, Fukusato T, Matsuda M, et al. Gadolinium-based agent accumulates in the brain even in subjects without severe renal dysfunction: Evaluation of autopsy brain specimens with inductively coupled plasma mass spectroscopy. Radiology 2015;276:228-232. Dillman JR, Ellis JH, Cohan RH. Frequency and severity of acute allergic-like reactions to gadolinium-containing IV contrast media in children and adults. AJR 2007;189:1533-1538. Kribben A, Witzke O, Hillen U, et al. Nephrogenic system fibrosis pathogenesis, diagnosis, and therapy. JACC 2009;53(18):1621-1628. Brenner DJ, Elliston CD, Hall EJ, et al. Estimated risks of radiation-induced fatal cancer from computed tomography. Am J Roentgenol 2001;176:289-296. Hall EJ. Lessons we have learned from our children: cancer risks from diagnostic radiology. Pediatr Radiol 2002;32:700-706. Weinberg PM. Aortic arch anomalies. In: Allen HD, Driscoll DJ, Shaddy RE, et al, eds. Moss and Adams’ Heart Disease in Infants, Children, and Adolescents, 7th ed. Philadelphia: Lippincott Williams & Wilkins; 2008:732. Dillman JR, Attili AK, Agarwal PP, et al. Common and uncommon vascular rings and slings: a multi-modality review. Pediatr Radiol 2011;41:1440-1454. Gould SW, Rigsby CK, Donnelly LF, et al. Useful signs for the assessment of vascular rings on cross-sectional imaging. Pediatr Radiol 2015;45: 2004-2016. Hernanz-Schulman M. Vascular rings: a practical approach to imaging diagnosis. Pediatr Radiol 2005; 35:961-979. Kommerell B. Verlagerung des Ösophagus durch eine abnorm verlaufende Arteria subclavia dextra (arteria lusoria). Geb Roentgenstrahlen. 1936;54:590-595. Yu JM, Liao CP, Ge S. The prevalence and clinical impact of pulmonary artery sling on school-aged children: a large-scale screening study. Pediatr pulmonol 2008;43(7):656-661. Schnabel A, Glutig K, Vogelberg C. Bridging bronchus—a rare cause of recurrent wheezy bronchitis. BMC Pediatrics 2012;12:110. Backer CL, Mongé MC, Popescu AR, et al. Vascular rings. Sem Pediatr Surg 2016;25:165-175. Fiore AC, Brown JW, Weber TR, et al. Surgical treatment of pulmonary artery sling and tracheal stenosis. Ann Thorac Surg 2005;79:38-46. Poletto E, Mallon MG, Stevens RM, Avitabile CM. Imaging Review of Aortic Vascular Rings and Pulmonary Sling. J Am Osteopath Coll Radiol. 2017;6(2):5-14. Erica Poletto, M.D., Mary G. Mallon, M.D., Randy M. Stevens, M.D., Catherine M. Avitabile, M.D. Dr. Poletto and Dr. Mallon are with the Department of Radiology, Dr. Stevens is with the Department of Surgery, and Dr. Avitabile is with the Division of Pediatric Cardiothoracic Surgery at St. Christopher's Hospital for Children and Drexel University College of Medicine, Philadelphia, PA.